Timelines are great for helping children (and adults!) see the big pictures of how events relate to one another, especially when it comes to Biblical and world history. So many of us see Biblical history and world history as two different categories. Timelines help us see how they blend and overlap. There are different types of timelines – wall timelines & notebook timelines. You can also do a biographical timeline of a person’s life. Timelines can be as detailed or as plain as you want them to be. Below is a wall timeline that is pre-done for you. It is called a register and is produced by Rod & Staff. While it is pretty and gives good information, it is probably my least favorite timeline because the children have learned the least from it. Why? Because they have done no work on it themselves. They have not written on it or colored any pictures. They have looked at it a lot, but they have done little to embed the facts in their memory. 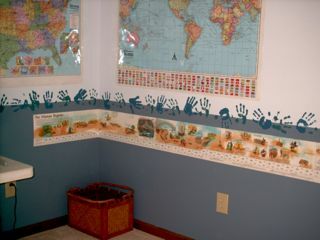 In my opinion, children learn more from the wall timeline shown below because they work on it themselves. It is a work in progress that they add to over the course of a school year or many school years. We actually have two timelines hanging in our schoolroom. We don’t have space for two side-by-side so they hang one on top of the other, one has ancient history and one has from about 600 AD to the end of World War II. The modern history timeline adjusts every so often as our studies change. 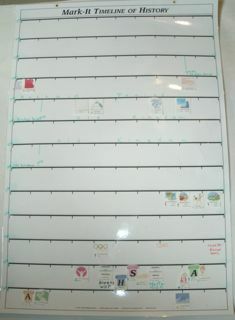 If you will laminate your timeline and use dry erase markers, you can reuse it over and over. Now that we live in an apartment, I no longer have a schoolroom. Technically, I do have the wall space for a wall timeline, I just don’t want a timeline being part of our decor. Thankfully, I have two large doors on the laundry closet. We joined two timelines into one to give us an extra long timeline to cover from Creation until now. If you don’t have space for a wall timeline, you can buy a cutting board from a fabric store that folds up and can be stored under a bed or in a closet. Cover it with a solid color contact paper. Use colored duct tape for the timelines. Pull it out when you need it and put it away when you don’t! Notebook timelines are my favorite timelines of all! 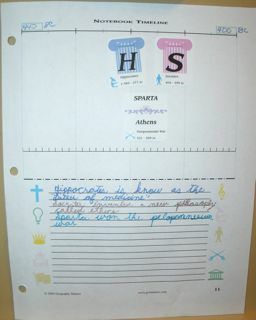 Our boys kept a timeline notebook that they added to from 4th/5th grade until they graduated. It doesn’t matter what we studied or what curriculum we used, the timeline notebooks were a constant work in progress. They each had a three-ringed binder that they used. And I have a binder that I use to keep all of the timeline figures in! I print out/copy 3 pages of each set, 1 for each boy’s notebook and 1 for the wall timeline. They would cut out the figure(s) that they needed at that moment and the rest are put in a plastic page protector and stored in the binder. I still have the binder that I used with our sons and am now beginning to use it with our 9 year old daughter. 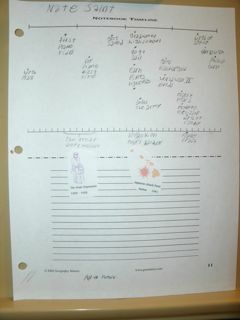 Our family uses the notebooking timeline pages from the Historical Timeline Figures CD from Geography Matters. What I really like about their pages is they are easy to mark off time spans. Most of our pages are in 40 year spans because each page has four columns. The bottom half of each page is set up for the children to write about the people or events that they have placed on the top half. Using different colored ink not only makes the page more attractive, but helps the children know what category the person or event is about. For example green can represent a scientist or scientific event, blue a military person or battle, gold could stand for royalty. Sometimes you know a time period had a lot going on and, over time, there will be a lot to add to a page. You can adjust your time span per page. In our notebooks, some time periods, like the 1930’s, have one page for a 10 year span. The Civil War and World War II both have pages that cover one year per page. Biography timelines are a great tool for helping children not only learn the events of a person’s life, but also to see how world events fit into their lifetime. Start your timeline with the year of the subject’s birth. Use the hash marks on the line at the middle of the page to delineate each year. Use the upper portion to mark momentous occasions in the person’s life and the thinner section below the hash marks to note world events. Most people will need two to three pages for their biographical timeline. As the children get older, more can be expected of them in regards to how much they write about the people and events in their notebooks. You don’t need to have them toss out what they did when they were younger though. If you are like me, those things are precious to you and bring back many happy memories! If you will notice the line above the second hole punch that has the vertical hash marks. If you cut along that line, you have a half page that can be added on top of the current page for your older child to write more information to add to what he/she wrote as a younger child without losing the previous work.